The Mermaids' Porch feels like you're visiting your favorite aunt. You'll immediately feel comfortable, slightly spoiled, but not intruded upon. 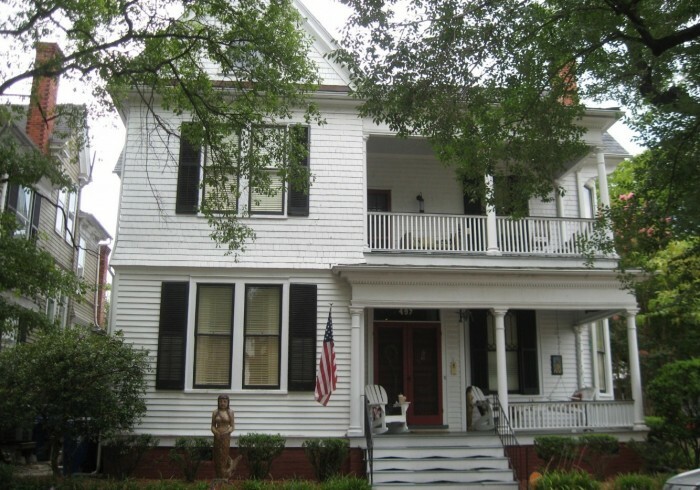 Located in a lovely Queen Anne Victorian home built by Dr Parrish in 1898, the bed and breakfast has three cozy rooms to choose from for the world weary traveler to tuck in and rejuvenate. The home is decorated in a sophisticated eclectic fashion by the well-traveled innkeeper. The public spaces include the namesake front porch decorated with several unique mermaids and a siren swing where you can while away the hours waving to the friendly neighbors as they walk to the park next door. Inside the Victorian living room includes a piano and fireplace to accommodate the musically inclined or those that just want to cozy up. The game room includes cable television, but also chess, cards and other board games to entertain yourselves in case of inclement weather or need of a respite. The courtyard includes areas to sit a spell and enjoy nature with the option to relax in our hot tub. Finally, the dining room is where you’ll dine on a full breakfast made from locally procured items from our Farmers Market or other Virginia grown items. You’ll enjoy meeting Jack, the rescue dog. The secret is who rescued whom.